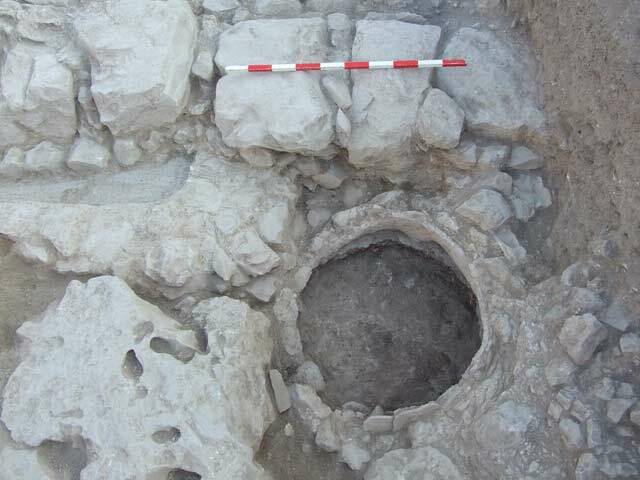 During August–September 2008, a salvage excavation was conducted in the southern quarter of the old city of Shefar‘am; west of the Catholic school (Permit No. A-5510; map ref. 216163–74/745442–61), prior to construction. The excavation, on behalf of the Israel Antiquities Authority and underwritten by the Jarus family, was directed by R. Abu-Raya (surveying), with the assistance of Y. Lavan (administration), A. Shapiro (GPS), H. Smithline (field photography), H. Tahan-Rosen (pottery drawing) and Y. Gorin-Rosen (glass). 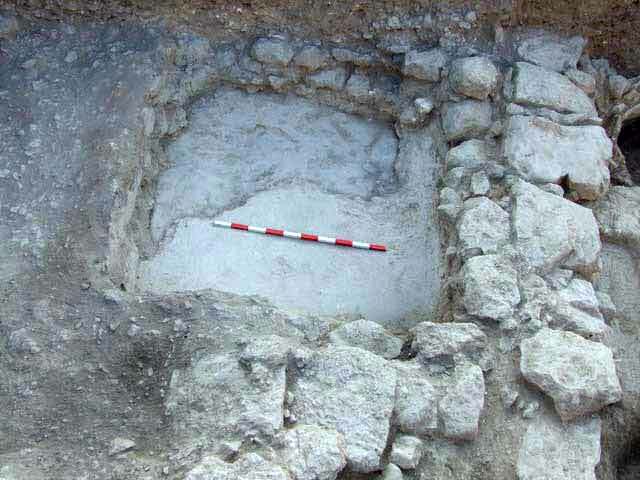 The excavation was carried out along the southern slope of the spur, at whose top stands the fortress, surrounded by the neighborhoods of the historic city of Shefar‘am. The settlement in Shefar‘am had existed without interruption since the Roman period, when it was established as one of the cities of the Sanhedrin. Nevertheless, archaeological research in Shefar‘am has been scarce; decorated burial caves were documented in the Survey of Western Palestine conducted in the late nineteenth century CE and an architectural survey was carried out in the fortress (Levant 32:77–96), as well as an excavation (HA-ESI 118). 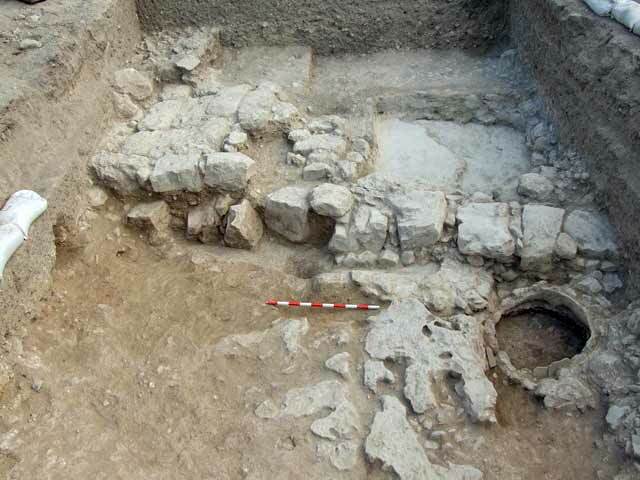 The remains of construction and installations, which are attributed to five phases in the Late Byzantine and the beginning of the Umayyad periods, were exposed in the excavation area (5×8 m; Figs. 1, 2). These are herewith described from the earliest to the latest. Phase I (Fig. 3). The finds attributed to this phase include a tabun (L113; diam. c. 0.8 m, height 0.5 m), a pavement of small fieldstones (L115) and a mosaic pavement that is probably part of a winepress’ treading floor (L114), which were founded on a layer of porous rock. The fill inside the tabun consisted of soil and small stones and contained several potsherds that dated to the end of the Byzantine period (end of sixth–beginning of seventh centuries CE; below). 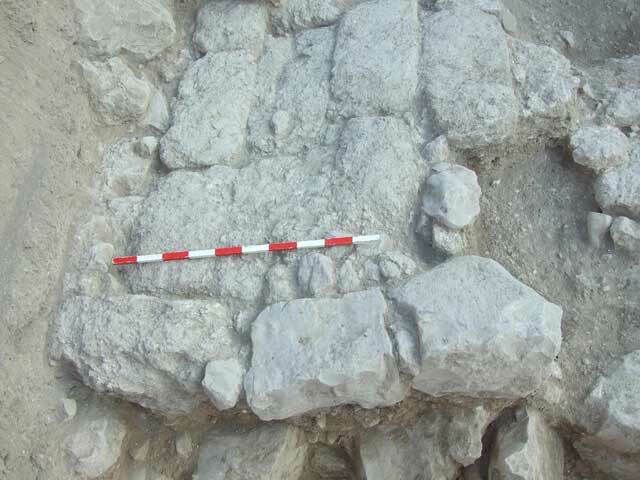 A narrow strip (c. 0.9×3.0 m) had survived of Pavement 115, southeast and northwest of the tabun, which it abutted. The continuation of the pavement to the west was apparently removed in the Umayyad period, as evidenced by the ceramic finds recovered from the fill that sealed the tabun and the floor, and extended down to bedrock in the western part of the area (L109). Treading Floor 114, paved with industrial tesserae and lined with gray hydraulic plaster, was to the northwest of the tabun. Although the floor was only partially exposed, as its continuation is covered with later construction, it was still possible to estimate its size (1.65×2.70 m, depth c. 0.15 m). A cupmark (L117; diam. 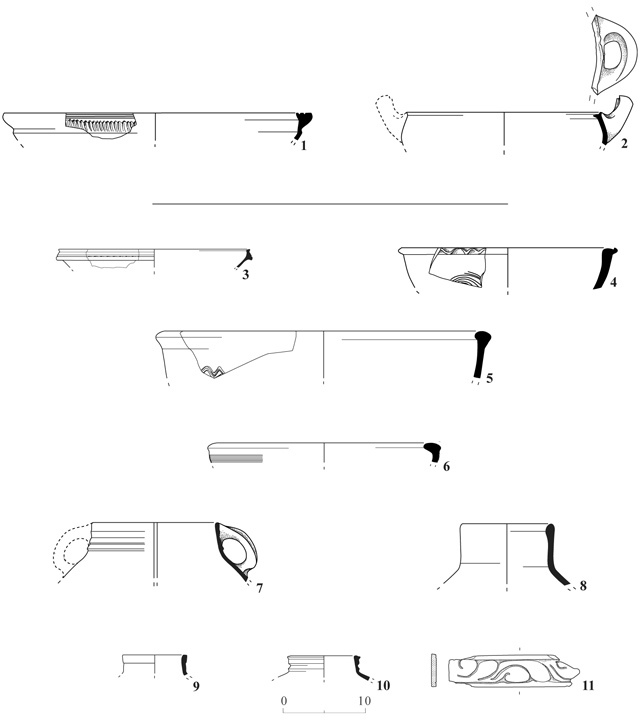 c. 0.35 m, depth 0.25 m), used for the collection of liquids, was installed at the southern end of the treading floor, on whose surface no diagnostic potsherds were found. Phase II. A small square winepress (L110; 1.65×1.65 m, max. depth 0.45 m; Fig. 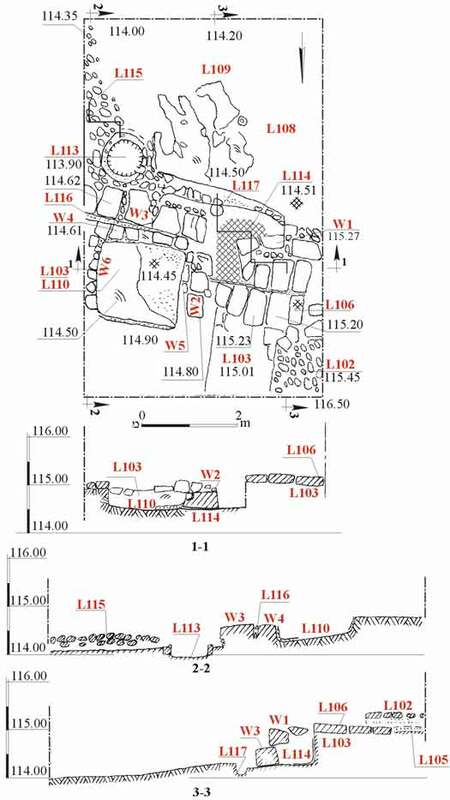 4) and a settling vat (L116) located to its south were built in this phase. The partly preserved sides of the treading floor (W4–W6; width c. 0.3 m) were built of fieldstones with ashlars incorporated between them; their inside surface was plastered with hydraulic mortar and lined with potsherds. A retaining wall of neatly hewn stones and ashlars (W2) was affixed to the western side of the floor. The sides and W2 were founded on bedrock, except for the southwestern corner of the treading floor, which was built on top of Treading Floor 114. The bottom of the treading floor was coated with an especially thick layer of plaster (thickness c. 0.1 m) and dropped off sharply to the south, toward the settling vat; between the northern and southern sides of the floor was a 0.2 m difference in elevation. Settling Pit 116 was joined to the southern side of the treading floor. It was apparently plastered, but could not be examined since a wide wall (W3) was built above it in the next phase. Phase III. Wall 3, oriented east–west, was built in this phase; it covered the opening of Settling Pit 116 in the eastern winepress and part of Treading Floor 114 in the western winepress. Only the foundation course (length 5 m, width 0.85 m, preserved height 0.6 m) that was built of large roughly hewn stones (max. size c. 0.4×0.5×0.8 m) had survived of the wall. Phase IV. A pavement (L106; Fig. 5) of large, soft limestone ashlars (max. size 0.15×0.40×0.80 m), which probably belonged to a courtyard, is attributed to this phase. Only a small section of the pavement (2.5×2.8 m) was preserved in the western part of the excavation square. It was founded on firmly packed soil fill (L103), which extended to the east and north and sealed Treading Floor 110. The pavement was delimited from the south by three hard limestone blocks that were probably the remains of a wall (W1; length 1.75 m, width 0.35 m). South of the wall was a heap of large ashlar stones, some of which resembled the flagstones in the pavement (L108). This was probably the result of removing the stone pavers after the courtyard pavement was no longer in use or sometime later. In the absence of a stratigraphic context, it is difficult to determine when it occurred. Phase V. A pavement (L102; c. 1.0×1.2 m) of small fieldstones (diam. 0.10–0.15 m) was installed in this phase. It was placed on a foundation of tamped earth (L105), which sealed the flagstone pavement of the previous phase. Tabun 113, which is attributed to Phase I, contained handmade kraters (not drawn), an imported Cypriot bowl (Fig. 6:1) and an open cooking pot (Fig. 6:2) that dated to the end of the Byzantine period (end of the sixth–beginning of the seventh centuries CE). The accumulation and fill ascribed to the three later phases (III–V) yielded glass vessels (not drawn; below) and an assemblage of pottery vessels that were ascribed to the sixth–seventh centuries CE. The vessels that could be ascribed to the Umayyad period included an imported Phocaean ware bowl (Fig. 6:3), a bowl with a thumb-indented ledge rim (Fig. 6:4), kraters (Fig. 6:5, 6), a cooking pot (Fig. 6:7) and three jars (Fig. 6:8–10). A fragment of a bone inlay decorated with an incised floral pattern (Fig. 6:11) was also found. The excavation finds show that numerous rapid changes occurred at the site during the sixth–seventh centuries CE. At the end of the Byzantine period, the site was situated along the fringes of the settlement and used for industrial and agricultural installations. Following the Muslim conquest, a perceptible change occurred in the use of the area with the removal of the winepresses, probably due to the expansion of the Abbasid settlement into this region. It also seems that the Islamicization of large parts of the population in this period resulted in a significant decrease in the consumption of wine and the need for winepresses. Sixty-four fragments of glass vessels were found in the excavation, twenty-two of which could be identified. Most dated to the Byzantine and the beginning of the Umayyad periods (sixth–seventh centuries CE). The most characteristic vessels of the these periods in the assemblage are wineglasses with solid bases; a bottle rim that is folded-in and flattened, of a type that is very common to the Umayyad period; a funnel-shaped rim of a large bottle that is decorated with a wide trail below the rim and a fragment of a bottle neck decorated with wrapped trails. In addition, a fragment that belonged to the bottom part of a double cosmetic tube was not decorated and very carelessly crafted; one of the tubes is wide while the other is narrow. The finds also include a chunk of clean raw bluish green glass, which seems to be indicative, together with similar finds discovered in Shefar‘am in the past, of a glass industry in the region, but no evidence of the workshop’s location has been found to date. 2. General view, looking north. 3. Phase I, Tabun 113 and Treading Floor 114, looking north. 4. Phases II–III, Treading Floor 110, looking east. 5. Phase IV, Flagstone Pavement 106, looking north. 6. Pottery and a bone artifact.